Mary Ellen Jasper is actually a fossil stromatolite. 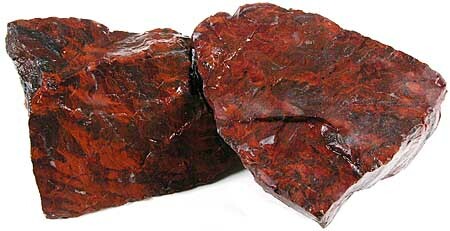 It has swirls of hematite mixed into a bright red background. very solid hard jasper. This fossiliferous material is 2.1 billion years old and the specie is Collenia undosa. Mary Ellen Jasper polishes with diamond, cerium or tin oxide. Mohs hardness 7. Mary Ellen Jasper#4 Measures approximately 5" x 2-1/2 to 1-1/2 " x 2-1/2 to 1/2" thick. Nice Pattern! Mary Ellen Jasper#6 Triangular shape measures approximately 7" x 5" x 4-1/2 to 2-1/2" thick. 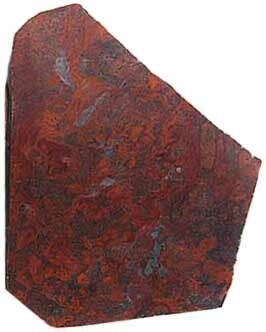 We also have SLABS of Mary Ellen Jasper!